Music, poetry and photography guided 44 Lasallian Volunteers (LVs) through their Midyear Retreat January 16 – 19, 2015. The goal of the retreat was to help LVs as they discern their next steps, for the short term and long term, and remind them of God’s presence in their lives. 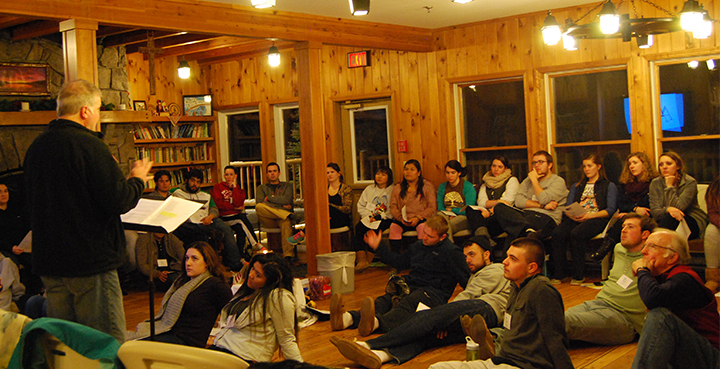 First-year LV Daniel O’Connell, who serves as a teacher, tutor and assistant athletic director at St. Raphael Academy in Pawtucket, Rhode Island, described the retreat as incredibly beneficial to his development as an LV. Charlie Legendre leads the group of LVs. Charlie Legendre, AFSC, director of the Office of Education – Covington in the District of San Francisco New Orleans, and Kevin Regan, social worker at the San Miguel School of Providence in Rhode Island, facilitated the retreat. With a time machine theme, Legendre and Regan used music, poetry and photography as entry points to invite LVs into reflections on the past, present and future. With music, LVs reflected on songs that were important to them in junior high or high school and identified what that song indicated about an enduring part of their character. With photography, they used recent photographs to reflect on their current priorities and sense of identity. With poetry, they envisioned their future through the lens of a poet, examined a collection of poetry, and wrote and shared their own poems. Each LV took home their own time machine to carry with them through the second half of their service year. Second-year LV Katie Christensen, who serves as a program coordinator at Serviam Gardens in Bronx, New York, left the retreat feeling thankful. She learned never to let her fear be bigger than her faith.